When Arnold Schwinn introduced his Super Balloon Tire Bicycle into the American market in the 1930s it was an instant hit with paperboys across the country. The wide pneumatic tyres ironed out the rough roads of the period — fast forward four decades to the 1970s, and that same soft-riding quality is what got Joe Breeze, Gary Fisher and the original Marin County mountain bikers down Mount Tamalpais, widely acknowledged as the birthplace of the modern mountain bike. It just so happened that the original mountain bikers’ heavily-adapted old Schwinn cruisers used 26in wheels. As manufacturers started making models designed specifically for this new craze of off-road riding, they stuck with the 26in format. It wasn’t until fairly recently that people have begun to question wheel size. Are 26in wheels really the best size, or is everyone simply sticking with tradition because that’s the way it’s always been done? Now that 29ers have gathered a solid following that has transcended the curiosity factor, the market is littered with large-wheeled off-roaders at pretty much all price points. There’s now no excuse not to consider them as a valid option against traditional 26in models. Cannondale has been in the game for three decades, one of the original US-based mountain bike manufacturers. It seems fitting that the company that was at the forefront of using now ubiquitous oversized aluminium tubes for mountain bikes has wholeheartedly embraced the latest wheel-size thinking. Cannondale has never been shy of embracing a different way of doing things. This is the company that brought you suspension built into the head tube in its HeadShok system, the single-legged Lefty ‘fork’ and large oversized 1.5in head tubes. These haven’t been innovations for innovation’s sake, but a genuine attempt to make things better, to take things forward. We picked out Cannondale’s Trail SL 29er 2 from the company’s extensive list of bikes. At £999, it represents a good balance between value and decent component spec. The sort of bike that someone may consider as an upgrade to their first, lower-specced mountain bike or as a replacement for an ageing model. The trademark Cannondale big fat frame tubes are now sculpted and formed to produce a fine-looking chassis. Finished in white with almost too-subtle light grey graphics, the bike looks fantastic. 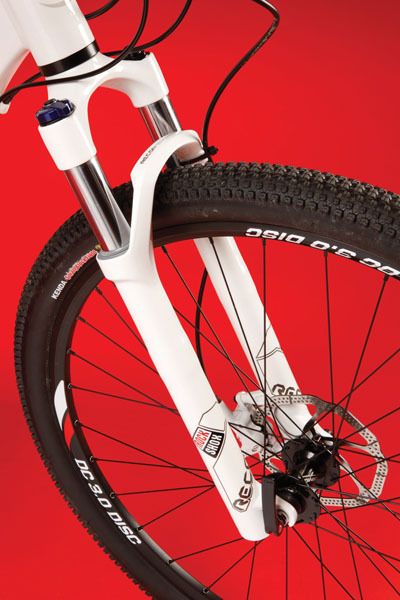 The big wheels are held in place at the front by RockShox’s venerable Recon suspension fork, finished in white to match the frame. Fitting bigger wheels to a mountain bike isn’t perhaps as simple as it may appear. The wheelbase has to be longer to accommodate the extra size and that means longer fork legs at the front and longer stays at the rear. This makes it harder for manufacturers to squeeze everything in on smaller frame sizes, but for larger sizes the fit is a better one — indeed, Cannondale only offers the Trail SL 29er in medium, large and extra large whereas the 26in version of the bike is offered in small. To accommodate the extra rubber, the 29er has a slacker head-tube angle than the 26in: 71 degrees as opposed to 70. It all adds to the lazier, more laid-back feel of the 29er. Another trade-off is less suspension travel. Many 26in bikes at this price point offer forks with 100mm travel, the 29er has 80mm. Simple maths dictate that offering the same amount of travel in the 29er would have raised the front end a further 20mm. Despite short travel, the Recons and large wheel combination soaked up the larger bumps smoothly. One twist of a dial on the fork and it can be locked out on less rough surfaces to ensure all of your energy is directed at the road and not in making the fork bob. We appreciated that RockShox has put a label on the fork leg telling you how much air pressure should be run in the fork for a variety of rider weights. A nice touch. You’ll need a shock pump, though, as one isn’t supplied. Cannondale’s proprietary Synapse Active Vibration Elimination (SAVE) stays do a good job of preventing trail bumps being transmitted directly to your backside after the front end has softened things up so well. As it stands, if you’re expecting the experience of sitting on board a 29er to be like riding atop a Penny Farthing you’re mistaken. Rolling along, there’s no appreciable difference in how high you’re sat despite the elevated axle height front and rear. What you do notice as you peer down over the bars is how much tyre there is stretching in front of you. A lot of rubber. The SL 29er 2 comes with SRAM’s X5 gears, which offer three rings at the front and 10 sprockets on the dinner-plate sized 11-36-teeth cassette — yes, 30 in total. Shifting is achieved with a satisfyingly sharp click, and we certainly didn’t either run out of gears or ever feel there was a huge jump between gear changes. The large 36-tooth low sprocket made climbing easy over loose surfaces. Avid’s hydraulic disc brakes have garnered a well-deserved reputation, and even these base-level Elixir 1 stoppers offered smooth braking power without ever being grabby or fading on longer descents. The own-brand post, bars, stem and saddle all have a solid feel and look to them, and there are some nice touches like the clamp-on grips and stem top-cap that add to the detail. We’ve talked a lot about wheel size without actually mentioning the wheels themselves, which are Formula disc hubs laced to Maddux DC3.0 rims. The ubiquitous black finish looks good, albeit in a workmanlike way. Despite their large size, the wheels didn’t noticeably flex from side-to-side when climbing out of the saddle and ran true throughout the test period. Job done. To get a true comparison with the performance of a 26in mountain bike, we took the SL 29er out on familiar trails. The thinking was that we’d be able to detect any difference in performance over tracks we’ve ridden countless times. Without a doubt, the Cannondale was a smooth-roller over rutted, potholed and rocky tracks. What surprised us more was that the closely-knobbled Kenda Small Block 2.1in tyres performed extremely well in the mud, keeping grip to the trail far beyond my expectations. As 29in tyres present a slightly larger surface area to the ground than 26in wheels, it could be down to this or it could just be the tyre choice. The combination of both worked well. The bike felt very stable on more technical trails, the longer wheelbase assisting the larger wheels in evening out the terrain. Where 29ers lose out slightly is in twitchy, narrow singletrack, and in the case of the SL 29er the slacker head angle makes for slightly less responsive steering than a tauter rig. On wider, sweeping trails and open tracks the Cannondale was a proper blast. People have likened hardtail 29ers to being like short-travel full-suspension (front and rear) 26ers, and the confidence it gives you on rough routes is indeed similar. However, you still can’t beat full suspension in any wheel size for ironing out deeper ruts and hits. Is a 29in mountain bike for you? A 29er isn’t magically going to give you 50 per cent more energy or ride 50 per cent faster. The differences are more subtle than that. It comes down to what sort of riding you do and on what sort of terrain. As an all-round, do-anything machine for off and on-road then 29in wheels make a lot of sense. On longer rides, the added comfort and stability was noticeable and we felt it rolled faster on tarmac sections than a 26in bike. What we will say as a definite is that the Cannondale Trail SL 29er 2 is a great-looking bike with a solid spec that rides well. As Cannondale offers an equivalent 26in version too, the choice is yours. The 29in mountain bike has come of age and you should add one to your try-out list if you’re in the market for a new mtb. ■ Larger, weightier wheels will — in theory — take more effort to accelerate. 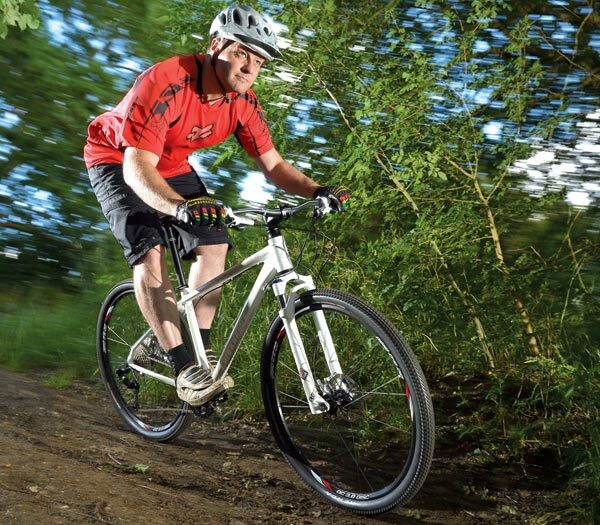 ■ More choice of wheels, forks and tyres for longer-serving 26in bikes. ■ 29ers make more sense in larger frame sizes than smaller ones. Spesh’s tried-and-tested M4 alloy frameset is married to RockShox XC32 forks and Shimano Alivio/SLX drivetrain for the same money as the Cannondale Trail SL 29er 2. Specialized’s offering is available down to 15.5in frame size — smaller than that offered by Cannondale. Or you could go for the 26in equivalent to Cannondale’s Trail SL 29er 2, the Trail SL 2, which costs £100 less than the big-wheel version and comes with RST Deuce Air fork, Shimano Alivio drivetrain and Shimano brakes.